TORONTO, April 26, 2018 /CNW/ - Corby Spirit and Wine Ltd., a leading Canadian marketer and distributer of spirits and wines, has once again placed on the Great Place to Work® Institute's list of Canada's 50 Best Workplaces. "It's a great honour to be recognized at this national level once again," says Patrick O'Driscoll, Corby's President and CEO. "This award signifies our commitment to creating a positive work environment, listening to feedback, and providing opportunities and resources for our team to excel. To be selected for this list is a tribute to the dedication and passion of our team, and I'm thrilled our employees continue to feel proud to work at Corby." Corby's scores from the anonymous Great Place to Work survey highlight 5 key areas of excellence: rewards & recognition, physical environment & resources, management competence & integrity, fun & cooperation, and learning & development. I Thank: a gamification-style twist on rewards & recognition – employees share badges based on a set of strategic capabilities to acknowledge colleagues for their hard work and achievements. Each year, five lucky winners get an extra week of vacation and $1,000 to donate to the charity of their choice! I Care: a committee that facilitates team-building volunteer initiatives for employees across the country and organizes awareness campaigns for important causes & issues. Employees can take up to two paid days off to volunteer at a local charity of their choice, or participate in group events organized by the I Care committee. "Distilled" On-Boarding: bi-annual event where new employees gather in Windsor, Ontario for a unique on-boarding experience at the Hiram Walker & Sons Distillery, where Corby's owned spirits are made. The two-day event includes a distillery tour, mixology classes, and training sessions about the company's purpose, business acumen, and brand education. "At Corby, we understand that organizations that focus on creating an inspiring work environment tend to be more successful financially and culturally," says Paul Holub, SVP of Human Resources. "This is why we're dedicated to motivating and empowering employees to bring forth their greatest potential." Corby is currently hiring! Visit corby.ca/careers to view open positions and apply. Great Place to Work® is the global authority on high-trust, high-performance workplace cultures. We are a research and consulting firm whose mission is to build a better society by helping companies transform their workplaces. 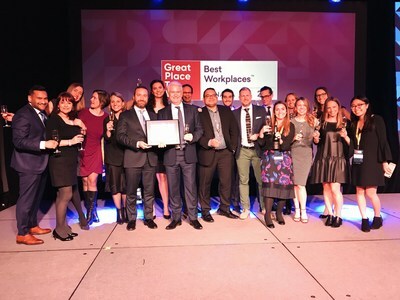 Through proprietary assessment tools, advisory services, and employer branding programs, including workplace certification and Best Workplaces lists, Great Place to Work® provides the benchmarks, framework, and expertise needed to create, sustain, and recognize outstanding workplace cultures. In Canada, Great Place to Work® produces the annual 100 Best Workplaces list, released in a national feature in the Globe and Mail. This is part of the world's largest annual workplace study, which culminates in a series of national lists in almost 50 countries, including the study's flagship list of 100 Best companies published annually in Fortune magazine. Globally, this survey represents the voices of 11 million employees, including approximately 300,000 from Canada alone. It's what makes this study so credible: the primary determinant used in selecting winners is an employee survey. There's only one way to get on this list – and that's if your employees put you there. Great Place to Work® online at http://www.greatplacetowork.ca and on Twitter at @GPTW_Canada.